To some, net-zero may sound like something from the realm of science fiction. It’s not. A net zero home is one that has the potential to create as much energy as it consumes. And in fact, according to an article in the Wall Street Journal, such homes may become mainstream in time. Why mainstream? Solar panels, for one thing, have now become affordable. That’s why you are seeing “solar farms” springing up on about every hillside that faces south. Many of these are developed to beat electric companies at their own game. For the homeowner, however, it’s simpler. Going net zero in Vermont means a lot of things, but freedom is often cited at the top of the list. With the fridged winters in the north country, it all starts with keeping the heat in and cold out. Heat will escape in one of two ways: Through radiating (infrared) and venting. Net-zero homes are sealed enclosures, insuring that an absolute minimum amount of air escsapes to the outside. Since all structures must have a source of fresh air, both building specs and code will require a heat recovery ventilation system to introduce a measured amount of fresh air. Most homes on the market today are built according to acceptable specs regarding heat-retaining capability. In 2012, for example, the energy code became more stringent, but it did not achieve the standards of net zero. With net zero, construction is spec’d to the absolute maximum, so that the efficiency of the building envelope is matched to the capacity of the heating (or HVAC) system. Thus, with net zero, there is no guesswork—the home is not simply a “box with a heater;” it’s an integral system where the structure and the infrastructure work as one. Poorly sealed windows and doors are often the biggest culprits to heat loss. When reviewing specs of windows and doors, first check each product’s “R” value. With windows, you’ll want to go beyond reviewing “R” value. 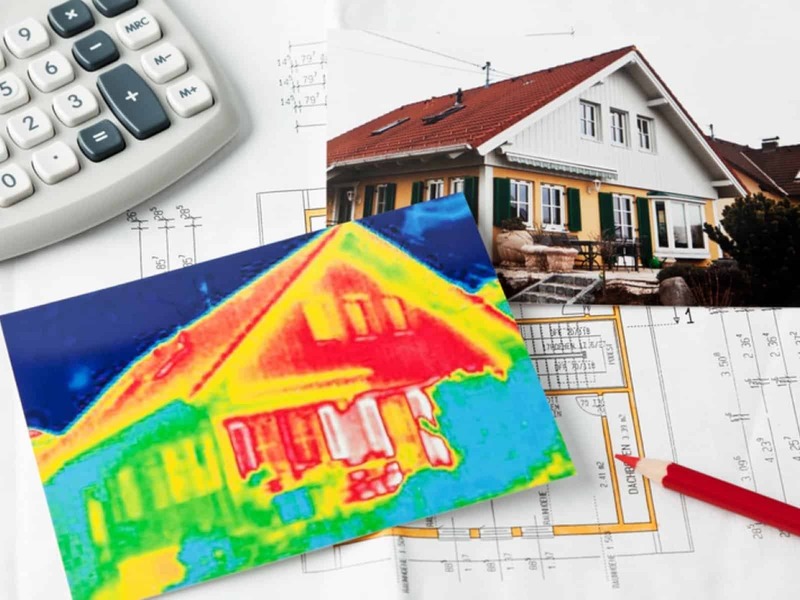 There are many more factors that need to be considered, from utilizing passive solar heat to more complex specs you can review at energy.gov. Net zero construction in Vermont utilizes techniques that prevent heat from conducting to the outside. A “thermal bridge” occurs when areas are poorly insulated or when thermally conductive materials are used in areas that create a path for heat to travel to cold. Homes are built with thermally conductive materials: wood, concrete, glass, and metal. Reducing thermal bridging between these conductive materials requires techniques like increased stud spacing and continuous insulation. The goal, obviously, is to insulate to the point where there is no contact with thermally conductive materials to the outside. Finding energy efficient lighting and appliances is probably the easiest challenge only because this issue has been at the forefront since the 80’s. With LED lighting now mainstream, any concerns over the absurd lack of efficiency (or life expectancy) of incandescent lighting are over. One thing you might consider is water usage. When shopping for clothes washers and dishwashers, check their water usage. A dishwasher uses only hot water. Check specs for all the cycles on each dishwasher you look at. You may find that a regular cycle uses about the same or even less water than a short cycle. Whether your goal is to save money, go green, or you’re just sick and tired of paying utility bills, a net zero home in Vermont will satisfy your goals.